Oliver Schabenberger, executive vice-president and chief technology officer of SAS Institute Inc. Automation, machine learning (ML) and artificial intelligence (AI) are changing the way companies think about, and use, software analytics, insists Oliver Schabenberger, executive vice-president and chief technology officer of SAS Institute Inc., a global analytics solutions provider. “It’s fascinating to think what happens when you apply these technologies to compete not only in new spaces but also in existing ones—how do we augment what we have already been doing," Schabenberger observed during a recent interview in Mumbai. Pointing out that ML is not a new space for companies, he acknowledged that it is AI, depending on “how you define it", that is “somewhat of an emerging area for us". Schabenberger cited the example of cognitive computing, where SAS has had solutions such as sentiment analysis, content categorization and entity extraction from text for decades. “But now," he said, “new technologies are being brought to bear in the same spaces—around deep learning, for example. That changed the accuracy with which we could solve some of these tasks." Schabenberger likened data to fuel and analytics to the engine of the new economy. “We see a big change in the way analytics is being used now," he said, pointing out to several nuances in how the term ‘analytics’ or ‘advanced analytics’ are being used. Defining analytics as a “multi-disciplinary approach to deriving insights from data," he said there are different degrees of analytics, starting with descriptive analytics in which you look at historical data to find out what is going on in an organization, what has happened, and what can be learned from that data. The next step, he noted, is predictive: what will happen? Can I forecast the future? “When we get into the predictive space, analytic techniques become more advanced," he said. In Schabenberger’s opinion, many of the predictive tools would fall under what we today call AI. “However, AI and machine learning have become such buzzwords that many different things get lumped under them. At SAS we try to delineate these areas clearly and have a good understanding of what we mean by deep learning or AI. My calculator is better at arithmetic than I will ever be, but it’s not AI," he said. Prescriptive analytics goes a step ahead—it is often used as a more advanced form of predictive analytics, according to Schabenberger. “It tells us how we should run our business—not just predict what will happen but tell us what we should do," he said. The underlying motivation for the adoption of ML and AI right now, insists Schabenberger, is automation. “It’s like we have so many problems to solve based on data—and data is reaching such velocity and volume that we need to find ways to automatically, and more dynamically, derive insights," he said. In his view, there are different levels of automation. One is “ingest the data, learn from the data and find the right analytic technique" to solve the problem at hand. “That, to me, is classical machine learning. Then there is automation where computers actually write the algorithms that a computer scientist or software developer would have otherwise developed. That’s when we move into deep learning and what I call pragmatic AI," he explained. The key to solving the challenges in analytics usage, he said, is to first understand the “pain point in your business"—for example, what do customers think about a particular promotion? What is the cost behind customer churn? Where is revenue going to grow? “These are concrete questions that need to be answered—and then you map those questions to the right analytic technique," he said. “The early adopter of analytics in India is the banking, financial services and insurance (BFSI) sector and they have the most structured data as they had implemented core banking solutions more than a decade ago," said Noshin Kagalwalla, managing director of SAS Institute (India) Pvt. Ltd. He added that companies in this sector had the data “in the right format" to leverage analytics. Over time, however, analytics usage in other verticals has also grown. “Telecom is another vertical we are seeing tremendous uptake, as they have huge data volumes by virtue of hundreds of millions of subscribers. What is heartening to find in the recent past is that the government and the public sector units are also utilizing analytics in a big way," he said. For instance, the Central Board of Direct Taxes had a project called Project Insight, which looked at how the government could increase the tax payer base so as to drive more people to file taxes. Analytics is also helping the government to identify the profile of people who could be potential tax evaders. “So we are seeing huge uptake in usage of analytics both at central and state government levels," said Kagalwalla. Manufacturing is “another big area", in addition to the potential for analysing all the data from multiple devices of the Internet of Things (IoT) that is set to get a big boost from the government’s smart cities initiatives in the next few years. “We are in advanced discussions on several initiatives as we speak and hope that by the fourth quarter of 2017, we should see some clearly defined projects," said Kagalwalla. 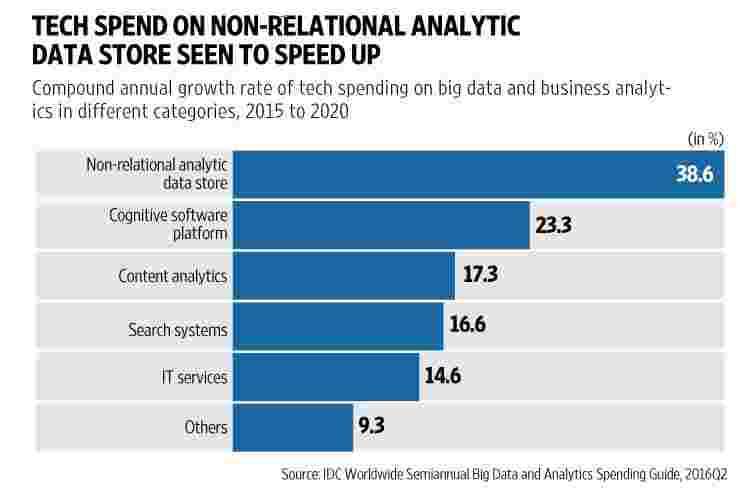 Worldwide revenues for big data and business analytics are forecast to reach $150.8 billion in 2017, an increase of 12.4% over 2016, according to a 14 March note by research firm International Data Corporation (IDC). The industries that will be making the largest investments (totalling $72.4 billion) in big data and business analytics solutions in 2017 are banking, discrete manufacturing, process manufacturing, federal and central governments, and professional services. They will also be the largest spenders in 2020 when their total investment will be $101.5 billion, the report said. Besides, SAS, the top companies in the analytics segment include SAP SE, Oracle Corp., Microsoft Corp., International Business Machines Corp. (IBM), Qlik, Tableau Software Inc., Teradata Corp. and Informatica. However, while the opportunity is huge, the challenges for companies are equally imposing. These include attracting the right talent (like data scientists, statisticians, etc. ), storing the data appropriately in data lakes so that quick retrieval is easy, dealing with security, privacy and compliance issues, and using the right tools to make business sense of the humongous amounts of structured and unstructured data. Schabenberger concludes that it is indeed a challenge for companies to have “the talent and the human brainpower and the number of eyes" to really look at all this data to make sense of it and build “static models as we have done in the past".